In 12-inch skillet, heat 1 tablespoon of the olive oil over medium-high heat until hot. Add garlic and onion; cook and stir about 5 minutes or until onion is light golden brown. Remove onion from pan. In same skillet, heat remaining 1 tablespoon olive oil until hot; add sliced Brussels sprouts. Cook and stir about 3 minutes or until leaves are slightly wilted. Stir in onion; keep warm. To make vinaigrette, in 6-inch skillet, cook bacon until crisp. Drain, reserving 1 tablespoon of the bacon drippings. Add remaining vinaigrette ingredients; heat until sugar is dissolved. Place warm Brussels sprouts mixture in large serving bowl; toss with hot vinaigrette. Top with chopped egg. 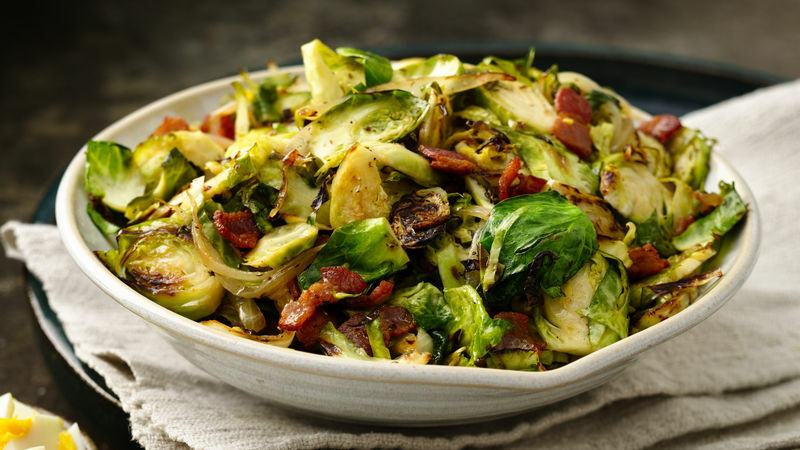 Enjoy this delicious salad made with fresh Brussels sprouts and tossed with bacon vinaigrette – perfect for side dish.